CHICAGO – Family 4-packs! In the latest HollywoodChicago.com Hookup: Film, we have 25 family 4-packs (100 seats in total) up for grabs to the new family fantasy film “Pan” starring Levi Miller as Peter Pan with Hugh Jackman! Note: When entering, you MUST enter your preference for a family 4-pack or admit-two tickets. “Pan,” which opens on Oct. 9, 2015 and is rated “PG,” also stars Garrett Hedlund, Amanda Seyfried, Rooney Mara, Adeel Akhtar, Nonso Anozie and Kathy Burke from director Joe Wright and writer Jason Fuchs with characters by J.M. Barrie. To win your free “Pan” passes courtesy of HollywoodChicago.com, just get interactive with our social media widget below. That’s it! This screening is on Saturday, Oct. 3, 2015 at 10 a.m. in downtown Chicago. The more social actions you complete, the more points you score and the higher yours odds of winning! Completing these social actions only increases your odds of winning; this doesn’t intensify your competition! From director Joe Wright comes “Pan,” a live-action feature presenting a wholly original adventure about the beginnings of the beloved characters created by J.M. Barrie. Peter (Levi Miller) is a mischievous 12-year-old boy with an irrepressible rebellious streak. In the bleak London orphanage where he has lived his whole life, those qualities do not exactly fly. Then one incredible night, Peter is whisked away from the orphanage and spirited off to a fantastical world of pirates, warriors and fairies called Neverland. There, he finds amazing adventures and fights life-or-death battles while trying to uncover the secret of his mother – who left him at the orphanage so long ago – and his rightful place in this magical land. 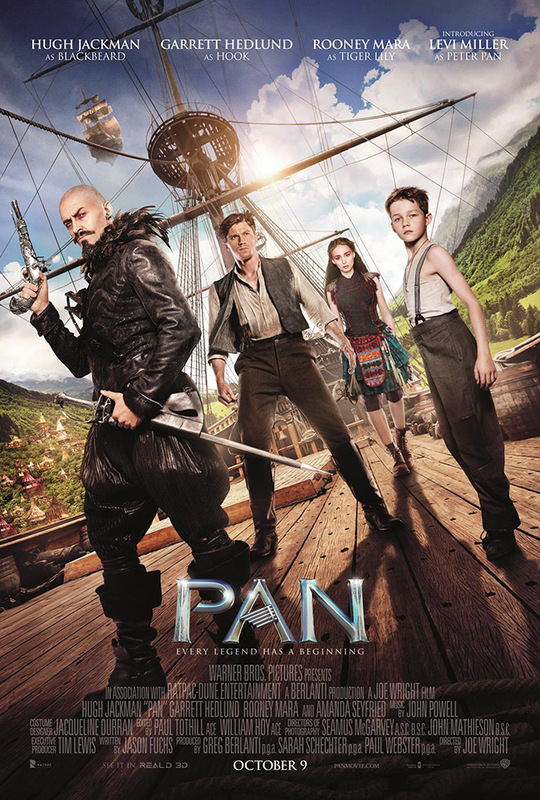 Teamed with the warrior Tiger Lily (Rooney Mara) and a new friend named James Hook (Garrett Hedlund), Peter must defeat the ruthless pirate Blackbeard (Hugh Jackman) to save Neverland and discover his true destiny – to become the hero who will forever be known as Peter Pan. The movie poster for “Pan” starring Levi Miller and Hugh Jackman. This HollywoodChicago.com Hookup is simple! Just get interactive in our social media widget above. We will award 100 seats in total (either as family 4-packs and/or admit-twos) based on social entry numbers and/or randomly via e-mail for our “Pan” Hookup. Good luck!